Okay, below is their entire 68 page document that reads, well, frankly like a horror show. And you know what, it’s the closest thing I’ve seen to the truth in a long time that comes from a commercial bank. Of course this is their worst-case scenario, not their favored one. Well, I don’t think anyone favors economic collapse, except when it can potentially bring down the oligarchs who brought the debt slavery to the world… yeah, on the other hand maybe it will be cheered! Of course one must be careful what one asks for! Kind of like attacking Afghanistan or Iraq without a real plan or exit strategy – you know, minor details like once you remove Saddam, what type of government follows? Or what do you win in Afghanistan, what does that look like, Americans with pots full of poppies? What the hell is the point already, Osama got away, it is WE who are breeding future terrorists for export, do we plan on being there forever? But I digress, we are talking about economic collapse, SURELY, these misguided and insanely thought out war policies have nothing to do with economic collapse! Right? But that’s NOT why I’m showing you their report. No, I’m showing it because as bearish as this paper is, and it is bearish, the writers of this paper unwittingly provide several great examples of BOXING the Bearish issues in. This is one of the oligarch’s favorite strategies… they surround and confuse the real issues by supporting both Republicans and Democrats. They prefer our money be backed by DEBT so that they can skim every transaction and charge the people interest on the money that rightfully belongs to the people, not a few private individuals. And while they prefer our money be backed by debt, it doesn’t really matter if it’s backed by gold, they’ll control and manipulate that too, although it’s not their ideal situation… no, no, their ideal situation is a one world currency and a globe full of people who are indebted to THEM, and a world full of countries whose people and natural resources THEY can control. 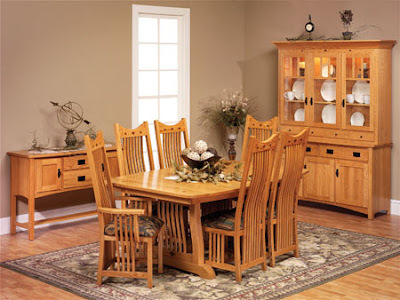 Thus, the issue of money is likewise BOXED IN – Debt backed currency/ Gold backed currency. 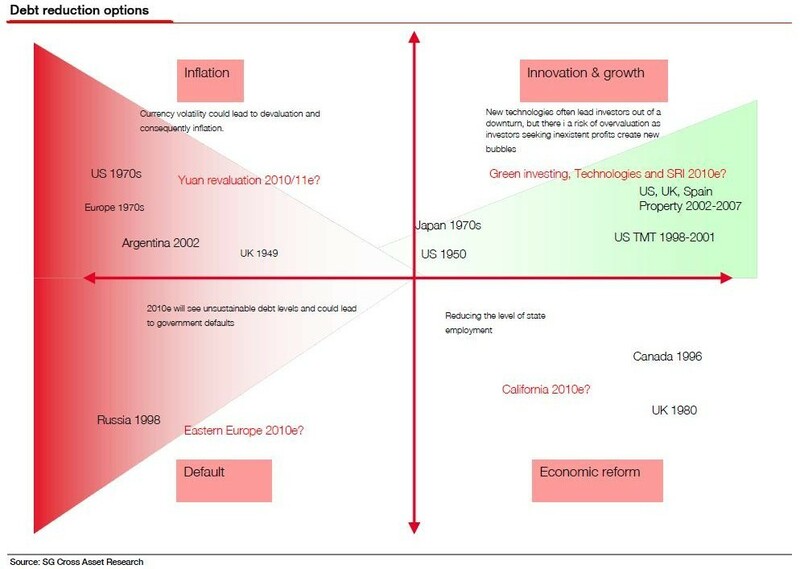 Now SocGen is doing the boxing… economic collapse via inflation or deflation? 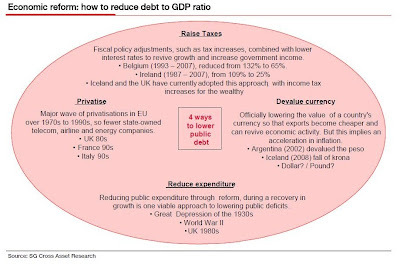 Solutions to the debt problem... BIG BOXES, let’s take a look and see if that’s really all the options available, shall we? This first chart should terrify you, its household debt to GDP going back before the Great Depression. 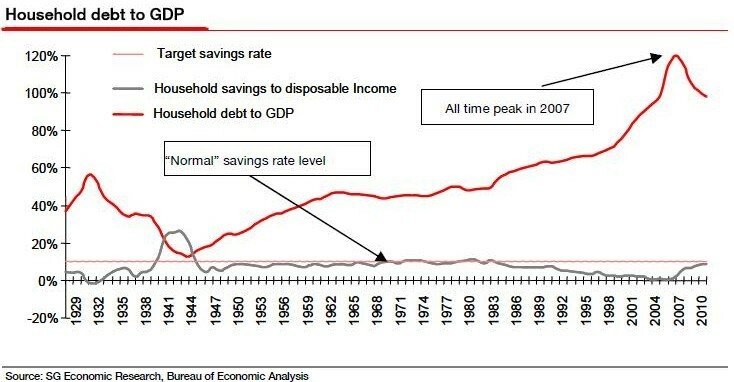 You’ll note that just prior to the Great Depression that household debt levels equaled about 60% of GDP. In 2007, at the start of this Depression, our debt level was TWICE that, at 120% of GDP. Now, GDP is NOT calculated today like it was back then... today’s GDP number is VASTLY OVERSTATED. That means that our household debt to GDP is vastly UNDERSTATED. 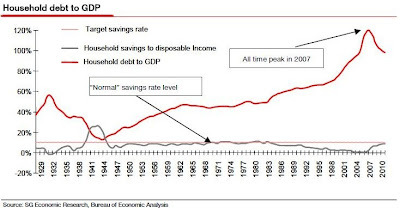 If GDP is 40% overvalued, like I think it is, then REAL household debt to GDP is something more on the order of 200% or more of GDP, or more than three times levels prior to the Great Depression. Guess what, that is just the tip of the iceberg as all levels of our “modern” day society are equally or worse as saturated with debt. And we haven’t even begun to talk about derivatives – but then again, SocGen’s “worst-case” scenario hasn’t mentioned any of that either! But what really got me on this path of boxes is their following very pretty and even mesmerizing chart of possible “Debt Reduction Options.” Here we find four quadrants of “options…” Inflation (what all the goldbugs think will happen), Default (what history shows always happens), Economic reform (Ooo, what’s that? ), or Ta Da, there’s Innovation and Growth via “GREEN Investing.” Which would you choose? Of course the only option they can see for economic reform is reducing State employees. THAT is what I call thinking inside the box. None of it really sounds that appealing, of course, but don’t you feel just a little bit more attracted to the green color in the upper right? Are these really the only possible outcomes? How about out and out capital flight? How about another world war? How about following all out collapse we get fascism? Is there not ANYTHING else that could be attempted? How about bailing out the people? I know, that’s not in a banker’s vocabulary, and it’s not inside their box either. How about monetary AND political reform centered around a money system owned and controlled by the people that is not backed by debt or gold and yet can keep inflation completely under control? Is that possible? No, no, that is WAY too far outside of any box they have ever seen… entirely impossible they would say. And I would say that not only is it entirely possible, it’s absolutely doable and the way to go if done properly with clear objectives. But this paper isn’t about that, I simply wanted to show you how the issues are being boxed. By the way, their worst-case scenario as I read it is kind of my “muddle-through” scenario Japan style. These guys don’t even know how to imagine worst-case. 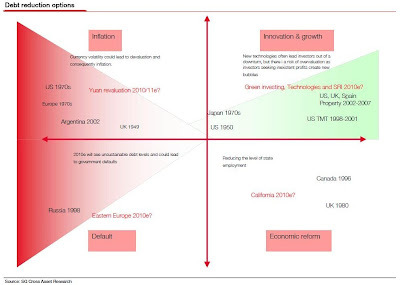 No imagination, that’s why they and their outcomes and solutions are stuck inside of central banker boxes. Woohoo! 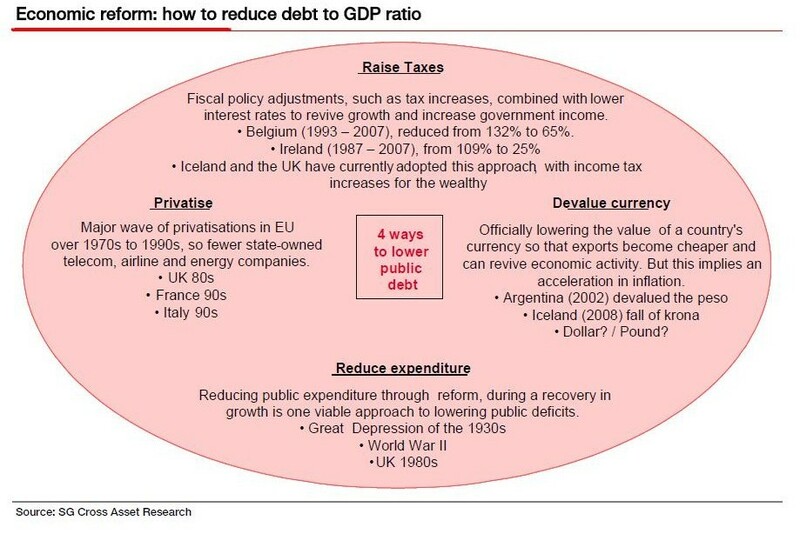 Let’s see, to them the 4 possible ways to reform economics are; Raise Taxes, Devalue Currency, Reduce Expenditures, and Privatize… or some combination of the four! Oh boy, I can tell you’re getting truly hopeful about our future now knowing that we have such creative people behind our economy. Tell you what… I may be just a dreamer, but I think there are plenty of solutions that sound much better than those, but you definitely won’t find anything good in that circle other than reducing expenditures… that sounds good, but it’s not going to solve the problems that PLAGUE us once and for all. Monetary reform means understanding that “It’s not WHAT backs your money, it’s WHO controls its QUANTITY.” When you begin to contemplate that, THEN you will be thinking outside of central banker boxes. That’s where I’m headed, I think you’ll find that freedom is much closer to you when your money doesn’t come into being as an interest bearing instrument of debt. But that’s just me, and I’m sure the central bankers won’t agree.